Everyone has their own go-to comfort food, and mine is pasta. It probably dates back to when I was a vegetarian. I wasn't an adventurous eater, so my old standby was a bowl of spaghetti with marinara. Now that I eat meat and have a bit more of an adventurous palate, I'll try new foods, but pasta is still what makes me feel all warm and fuzzy inside. 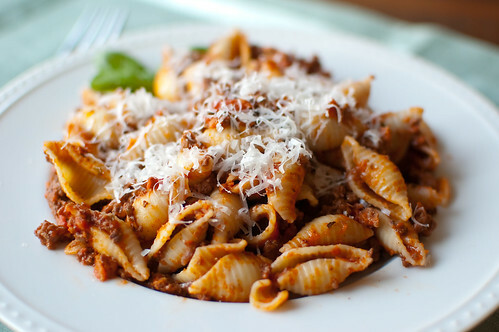 By definition, bolognese is a sauce that is simmered for hours and hours, building flavor. However, sometimes the craving for pasta with meat sauce doesn't hit until 5 pm. And then what's a girl to do? Turn to Ina, of course. Her weeknight version of bolognese contains the basics: beef, tomatoes, and cream. But she throws in some extras to boost the flavor: oregano, red pepper flakes, basil, red wine, and nutmeg. Her additions give the sauce an intense flavor, and what's more is that it's achieved in under an hour. Which is key for this busy mom. adapted from Ina Garten, How Easy is That? Add the sirloin to a large skillet over medium-high heat. Cook, crumbling the meat with a wooden spoon, 5-7 minutes, until the meat has started to brown and is no longer pink. Stir in the garlic, red pepper flakes, oregano, and tomato paste and cook for 1 more minute, or until fragrant. Pour 1 cup of the wine into the skillet and stir to scrape up any browned bits. Add the tomatos 2 teaspoons of salt, and 1 teaspoon of pepper, stirring until combined. Bring to a boil, lower heat, and simmer 10-15 minutes. Meanwhile, bring a large pot of salted water to boil. Add the pasta and cook until al dente. Drain and pour into a large serving bowl. As the pasta cooks, finish the sauce. Add the nutmeg, basil, cream, and remaining 1/4 cup wine. Simmer for 8 to 10 minutes, stirring occasionally until thickened. Add the sauce to the pasta, along with the Parmesan cheese, and toss well. Serve hot and pass additional Parmesan at the table. We absolutely love this recipe and sadly, I was too busy loving it to get any photos. :( Next time! You've certainly captured this dish perfectly! Love this recipe, and basically everything Ina! It really is a great go to! Yum! My husband loves bolognese style pasta, and I've never had it. I know....so I can't wait to try this! Wow! And Yum! This looks awesome Josie! Hmmm - this looks like the perfect weeknight meal Josie. Wish I could have some right this second. My go-to comfort food is pasta, too, and this one gives me butterflies. Can't wait to make it!